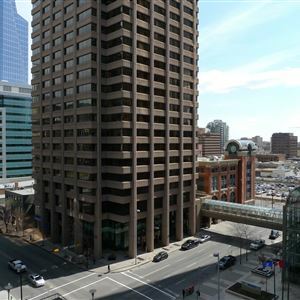 Property Location Located in Calgary (Downtown Calgary), Ramada Plaza Calgary Downtown is minutes from Century Gardens and McDougall Centre. This eco-friendly hotel is within close proximity of CORE Shopping Centre and Knox United Church. Rooms Make yourself at home in one of the 201 air-conditioned guestrooms. Cable programming and video-game consoles are provided for your entertainment, while complimentary wireless Internet access keeps you connected. Private bathrooms with shower/tub combinations feature complimentary toiletries and hair dryers. Conveniences include desks and coffee/tea makers, and housekeeping is provided daily. Amenities Enjoy recreational amenities such as an outdoor pool and a fitness center. This hotel also features complimentary wireless Internet access, gift shops/newsstands, and a hair salon. Dining Grab a bite at one of the hotel's 2 restaurants, or stay in and take advantage of room service (during limited hours). Quench your thirst with your favorite drink at a bar/lounge. Full breakfasts are available for a fee. Business, Other Amenities Featured amenities include a 24-hour business center, express check-out, and dry cleaning/laundry services. Planning an event in Calgary? This hotel has 10000 square feet (929 square meters) of space consisting of conference space and meeting rooms. A roundtrip airport shuttle is provided for a surcharge (available 24 hours), and limited parking is available onsite. 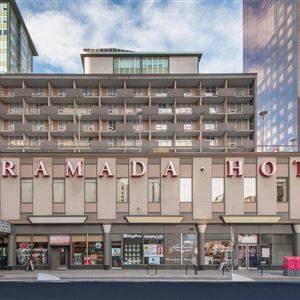 Located in Calgary (Downtown Calgary), Ramada Plaza Calgary Downtown is minutes from Century Gardens and McDougall Centre. This eco-friendly hotel is within close proximity of CORE Shopping Centre and Knox United Church. Make yourself at home in one of the 201 air-conditioned guestrooms. Cable programming and video-game consoles are provided for your entertainment, while complimentary wireless Internet access keeps you connected. Private bathrooms with shower/tub combinations feature complimentary toiletries and hair dryers. Conveniences include desks and coffee/tea makers, and housekeeping is provided daily. Enjoy recreational amenities such as an outdoor pool and a fitness center. This hotel also features complimentary wireless Internet access, gift shops/newsstands, and a hair salon. Featured amenities include a 24-hour business center, express check-out, and dry cleaning/laundry services. Planning an event in Calgary? This hotel has 10000 square feet (929 square meters) of space consisting of conference space and meeting rooms. A roundtrip airport shuttle is provided for a surcharge (available 24 hours), and limited parking is available onsite.